That’s right. Sourdough cookies. Who knew you could do so much with sourdough? I’ve always loved sourdough bread, but I had no idea how versatile a sourdough starter really is! A couple of years ago I took the Gnowfglins Sourdough eCourse, and a whole new world opened up to me! Since then, I’ve made not only bread, biscuits, and pancakes, but also pie crust, cake, cookies, batter for frying onion rings, okra, and fish, and even donuts! 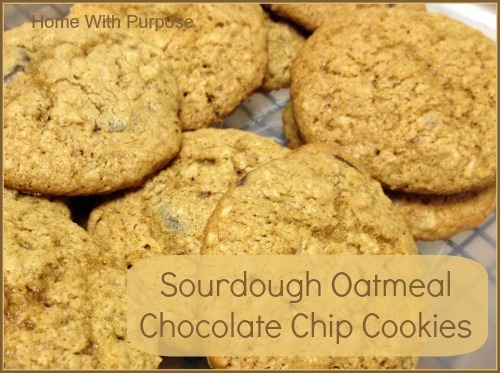 I shared one of those cookie recipes, Sourdough Oatmeal Chocolate Chip Cookies, on the Grain Mill Wagon blog this week. These cookies are based on the cookie recipe I learned in the eCourse. I’ve tweaked the ingredients, adding oats for their chewy texture, and chopped nuts and chocolate chips or cacao nibs. They combine the health benefits of freshly-ground spelt, rolled oats, sourdough, and unrefined sweeteners to create a delicious treat you don’t have to feel guilty about indulging in! Fresh-ground spelt, rolled oats, and a sourdough starter make for a delicious, chewy cookie! 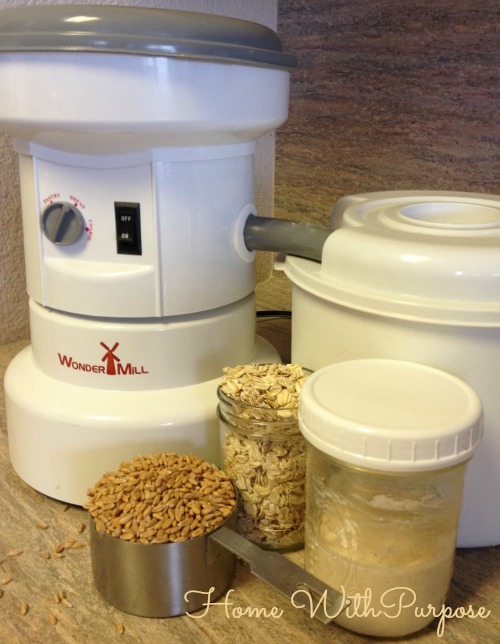 I’ve ground my own flour in my Nutrimill for years, but for the last six weeks or so, I’ve been trying out a Wondermill, thanks to the generosity of the Grain Mill Wagon. Sometime soon, I’ll be doing a comparison of the two, telling you what I like and dislike about each one. In the meantime, click over to the Grain Mill Wagon blog to get this delicious recipe!